This year theme for European Geoparks Week is ‘Discover More with a Guide’. The Burren and Cliffs of Moher UNESCo Global Geopark is encouraging visitors to the region to take the time to explore the unique Burren landscape in the company of a knowledgeable guide. There is a huge range of guided activities on offer in the Geopark from foraging walks and kayaking trips, to ferry cruises and underground cave tours. 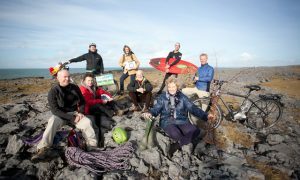 All guides on www.Burren.ie are member of the Burren Ecotourism Network and have extensive knowledge of the culture, heritage and geology of the Region. They are also received Geopark training. Dr. Eamon Doyle, Geologist, Burren and Cliffs of Moher Geopark explained that European Geoparks Week explores the underlying geology of the Burren and how it holds many fascinating clues to conditions on Earth during the past 300 million years, including the end of the last Ice Age 12,000 years ago which gave the Burren its current shape. On June 14th, We will also host a National School quiz that celebrates the unique Geopark landscape.